^ Abourbih S, Filion KB, Joseph L, Schiffrin EL, Rinfret S, Poirier P, Pilote L, Genest J, Eisenberg MJ (2009). "Effect of fibrates on lipid profiles and cardiovascular outcomes: a systematic review". Am J Med 122 (10): 962.e1–962.e8. ^ Jun M, Foote C, Lv J, et al. (2010). "Effects of fibrates on cardiovascular outcomes: a systematic review and meta-analysis". Lancet 375 (9729): 1875–1884. ^ Wysocki J1, Belowski D, Kalina M, Kochanski L, Okopien B, Kalina Z (2004). "Effects of micronized fenofibrate on insulin resistance in patients with metabolic syndrome". INTERNATIONAL JOURNAL OF CLINICAL PHARMACOLOGY AND THERAPEUTICS 42 (4): 212–217. PMID 15124979. ^ Staels B, Dallongeville J, Auwerx J, Schoonjans K, Leitersdorf E, Fruchart JC (1998). 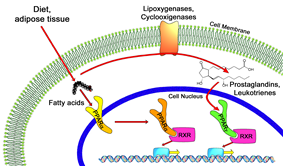 "Mechanism of action of fibrates on lipid and lipoprotein metabolism". Circulation 98 (19): 2088–93. ^ Zhao YY, Weir MA, Manno M, Cordy P, Gomes T, Hackam DG, et al. (2012). "New fibrate use and acute renal outcomes in elderly adults: a population-based study.". Ann Intern Med 156 (8): 560–9.